Format: 2-DVD set, bilingual, 6 eps., 150 min. Comments: A DVD for true audiophiles. If you are reading this right now, you should know what Cowboy Bebop is. If you don't... Where the hell have you been the last two years? Go buy, rent, or prostitute yourself a copy of the DVDs and watch them! That being said, in my opinion, the only real way to enjoy this series is on legit DVDs. Don't bother with those grainy, low-res fansubs or the poor quality imported Hong Kong discs; you'll need the digitally remastered mpeg-2 stuff to really appreciate the slickness of this series. I'm taking 4.7 gigabytes of Bebop goodness on each five episode, single-sided disk. The only downside of the original DVDs was that the audio is only in surround sound. That's only two channels of audio my friend, left and right. 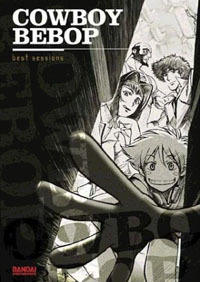 Since Cowboy Bebop is just a TV show, I really never thought more of it until Bandai decided to surprise us with Cowboy Bebop: The Best Sessions - six completely remastered episodes featuring Dolby Digital 5.1 and Digital DTS surround. For those of you non-audiophiles, what I just said is meaningless. "5.1? DTS? What the hell are you blabbering about?" you ask. Well, Digital 5.1 is six channels of sound as opposed to two. You get left, right, front center, rear left, rear right, and a subwoofer channel (for that extra bass). Dolby and DTS are two companies that have their own format for 5.1 sound. DTS is considered to be a bit higher quality than Dolby, but requires newer and more expensive receivers. The bottom line is this: You get sound from all directions, instead of just in the front. Needless to say, if you've got the hardware, this is far superior to old school stereo. Now, I've haven't got the best audio system in the world, but it's pretty good for a strapped college student. I'm packing a 500W speaker and sub system powered by a 5.1 Yamaha receiver. Since I'm a penniless student, all of this stuff was secondhand and I don't have DTS support, but it gets the job done. Watching the Best Sessions on this setup, I can attest that it's a far superior experience than just the old left and right channels (which are left sounding hollow and empty in comparison). The staccato of gunfire shattering windows bursts from behind you as the roar of Spike's Swordfish surrounds the room. You need to hear to it believe it. One downside is that Best Sessions contains only six episodes. Disk One features three director's choice episodes: Asteroid Blues, Ballad of Fallen Angels, and Wild Horses. Asteroid Blues, the first episode of the series, featured only Spike and Jet. They're after a man who uses the drug "Bloody Eye" to give himself enhanced speed and strength. When you look back at it, episode one really encompassed all of Cowboy Bebop; you had action, comedy, a bit a supernatural mystery (the shaman who tells Spike to look for the red-eyed coyote), and of course, a tragic ending. Ballad of Fallen Angels, the fifth episode, has more of a complete cast. We have, with the exception of Ed, almost all of the crew; Faye, Ein and Vicious join Spike and Jet as the recurring main characters. This episode is also the first to hint at Spike's dark past and, up to that point, was the most dramatic in the series. Ballad of Fallen Angels is unforgettable and an easy pick for this collection. The only oddball in the first disk is the last episode, Wild Horses. Spike takes his Swordfish II in for an overhaul while leaving Jet, Ed, and Faye to track down some ship-hacking bounties. I found this episode to be pretty mediocre (in comparison with some of the other episodes) and would have preferred something more unique. Toys in the Attic, Speak Like a Child, or Pierrot Le Fou would have suited my tastes better. According to the little information leaflet include inside the case, Shinchiro Watanabe (the director) chose these three episodes not because they were his favorites, but for their sound. Episode one had its gun sequences, episode five contained some great music, and Wild Horses had well, I can only quote, "mecha action". I have no idea what that means. I don't recall a single damn mech in all of Cowboy Bebop, but the Japanese don't operate on the same level of sanity as the rest of us. Disk Two contains fan favorites, Japanese fans' favorites. Waltz for Venus, the eighth episode, is about Roco -a young man who's on the run from a gang of thieves. He and Spike create an unlikely, but short-lived, friendship. This was one of my personal favorites; the story was both subdued and touching and although Roco was annoying at first, he became a likable character in the end. The second episode of this disk is Mushroom Samba. The crew of the Bebop is out of fuel and out of food. When they're hit by an inconsiderate spaceship and crash land, it's up to Ed to go out and forage for food. Of course, she ends up finding some not-too-safe mushrooms, and it's a hilarious head-trip from there on. This was one of the funniest episodes in the series, and I can see why it's included as a fan favorite. Hard Luck Woman, the third to last episode, is the beginning of the end. Faye finds her memory, Ed finds her father, and they decide that their home is on Earth. To top it off, Ein decides that he wants to stay with Ed, leaving Spike and Jet as the original and final crew of the Bebop. This episode is easily one of the 'best sessions' and rightfully deserves its place in the collection. If you're looking for extras, they won't be found in this set. All you get is video and three audio options (Japanese Dolby Digital, English Dolby Digital, and Japanese DTS). It's disappointing for such a special release, but the standard DVDs already come with a pretty good set of extras so I can't complain. Overall, if you've got a nice 5.1 system and are a Cowboy Bebop fan, this collection is worth picking up. Best Sessions would also make a great gift for someone interested in anime but hasn't seen much. It even comes with a reversible cover and a nice slipcase. But if you don't have the hardware, I can't honestly say that this is worth the $34.95 price tag. Just go out and pick up the standard DVDs - they're not in 5.1, but they do have extras and special features that this is lacking.